Part of Kumho's SUV and light commercial range, the 857 is a designed for use on van's/ trailiers 4x4's due to the load ratings and stability offered from the tyre. Despite offering up huge load ratings the Kumho 857 remains durable and the specially zig zagged tread pattern help to ensure traction and grip in all conditions. The company aimed to make a tyre that out perfomed and out lasted competitiors and the 857 does this. 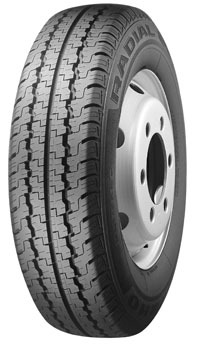 Offering an extremely smoth road with a strong carcass this is an excellent mid range light commercial tyre.